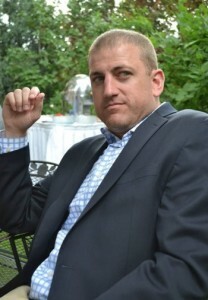 Dan Buri graciously agreed to talk with Book Obsessed. His first collection of short stories, Pieces Like Pottery, was published in October 2015. First off, thank you for hosting me on your site, Cecile. You have a wonderful blog! This is a great place for us all to indulge in our shared love of reading and writing, isn’t it? Thank you for your excellent content. I am grateful to be here and hopefully I have the opportunity to get to know your audience better. I would love your feedback and your reader’s feedback on my new book. I would be grateful if you got it and provided your insight. I grew up in the Midwest in the States with four brothers and one sister. I moved out to the beautiful Pacific Northwest a little over ten years ago. I am a patent attorney with an engineering background, which is what I spend my days doing when I am not writing. I have a beautiful wife and amazing two-year-old daughter who cracks me up daily. I can remember writing as far back as middle school. It’s something I have always enjoyed doing. I can recall writing stories and poems when I was just 5 or 6 years old. Outside of my fiction works, I have contributed to a wide variety of blogs and publications over the years—sports, law, marriage, business. Writing has been something I have always enjoyed doing myself and admired in other people. Story telling is a beautiful gift. I love learning to hone the craft. I find inspiration in my everyday life. I think good writers have a unique gift of empathy. They work hard to understand another person’s pains, hopes, dreams and fears. I really try to understand each person that I encounter in my life. These experiences tend to inspire me and seep into my writing. Once upon a time I thought I needed to write in a particular time and place. I would typically write at night and need to be in the perfect mood to do so. With a very demanding job, a wife, and two-year-old daughter, however, I quickly found that I was not finding much time to write at all. I had to begin writing anytime I could find a free 30 minutes. I was lucky I did too. I think young writers always wait for the moment of inspiration to strike. These moments are amazing, but they are a great luxury. The truth, in my opinion, is that writing is as much about editing and revising as it is about the writing itself. I have so many pages of Pieces Like Pottery on the cutting room floor, so to speak. Maybe editing is a beautiful and inspiring process for some people, but for most writers I know, it is painstaking. There’s nothing inspirational about it for me. Having very little time to write each day helped me to begin taking my writing to the next level, to learn to hone it as a craft, rather than writing simply being an inspirational hobby. I had to find time to write whenever I could, regardless of whether the circumstances were perfect. That being said, I still love to write at night over a glass of wine or a fine whiskey. Nothing beats that. In your opinion, what’s the best thing about being a writer? That’s what I love about being a writer. Do you sometimes have writer’s block? If so, how do you deal with it? Without question I suffer from writer’s block. I think any writer that says she/he doesn’t experience writer’s block is lying. I typically try to write my way out of it. It’s not fun, but I just keep writing. Usually the pages I write as I am trying to get out of writer’s block aren’t any good so I have to delete them all in the editing process, but hopefully I am eventually through it and back to writing quality content. I also have the luxury of writing non-fiction for a number of websites and blogs, so I can put my book aside at times and focus on other work. If all else fails, I stop completely. I go outside and go for a walk. Nature always seems to inspire me. Why did you choose to write a short-story collection rather than a novel? Great question. I am moved and inspired by people’s real life stories of overcoming tragedy. Every person has trials in life. Life always presents obstacles and disappointments. I wanted to examine how individuals overcome these obstacles in a variety of characters. I toyed with the idea of each of these stories being its own novel, and I still may expand a couple of them into full length novels, but I settled in on a collection of linked short stories because it presented the opportunity to have a range of characters and to display that, despite how different our life experiences are, we are all connected as human beings. We all suffer and laugh just the same. My hope is that readers recognize that and are inspired or moved to compassion through the book. Utilizing the thematic framework of each of the five sorrowful mysteries was simply a way to communicate that suffering and redemption. What was your experience with publishing? How long do you have? The current publishing environment is very difficult. Ebooks have done wonders for changing the accessibility of indie authors, both from a publishing standpoint as well as from a readership standpoint. It has become much easier to see your work published than, say, 20 years ago, but it is probably harder to get a publisher on board. For me, I was in a difficult position from the outset because this work is a collection of short stories. Publishers simply don’t like short story collections, even if they are linked to create an entire novel. So I published as an Indie author through my own publishing company—DJB Publishing. It offered the simplest avenue for me to publish the type of work that I wanted to publish. Do you have plans for a new book? If that’s the case, can you tell us about it? I am not actively working on publishing my next work, but I have been working on a few things recently. I’m considering expanding Expect Dragons, a short story from my book Pieces Like Pottery, into a full-length novel. I’m also considering a second collection of stories in this series. Pieces Like Pottery focuses on the Sorrowful Mysteries and themes from those mysteries. I am planning on a second collection that will focus next on the Joyful Mysteries. Finally, I have had an affinity from a young age for writers like Gertrude Warner, Shell Silverstein, and Dr. Seuss. I’ve always had an inclination to try my hand at a children’s or young teenage series. I have a few ideas in the works, so maybe I’ll try my hand at that. I’m not sure which will grab my attention firmest and push me to get serious with it, though. What would you suggest? What would your readers like to see? Thank you for taking the time to answer my questions! I wish you all the best in your future endeavors. Thank you, Cecile! I have appreciated this opportunity to spend some time with you and your readers. I loved it! You have a wonderful site. I really do hope you and some of your readers will check out my book. I need the support of thoughtful and intelligent readers like yours. The life of an indie author is not easy and I appreciate all the support I can get. And if your readers have questions or comments, please contact me. I would love to hear from you. You can reach me via email at danburi777 [at] gmail [dot] com or on twitter @DanBuri777. Thanks! 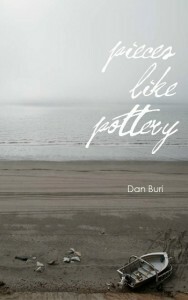 Dan Buri's first collection of short fiction, Pieces Like Pottery, is an exploration of heartbreak and redemption that announces the arrival of a new American author. His writing is uniquely heartfelt and explores the depths of the human struggle and the human search for meaning in life. Mr. Buri's non-fiction works have been distributed online and in print, including publications in Pundit Press, Tree, Summit Avenue Review, American Discovery, and TC Huddle. The defunct and very well regarded Buris On The Couch, was a He-Says/She-Says blog musing on the ups and downs of marriage with his wife. Mr. Buri is an active attorney in the Pacific Northwest and has been recognized by Intellectual Asset Magazine as one of the World's Top 300 Intellectual Property Strategists every year since 2010. He lives in Oregon with his wife and two-year-old daughter.